Forelimb flex tests: Should they matter in horse sales? You’ve decided to sell your horse and the potential buyer has sent a veterinarian to your farm to perform a purchase exam. As you stand beaming with satisfaction next to who you hope will be the new owner, the veterinarian picks up your horse’s left front leg. Bending it at the knee, he holds it for about 60 seconds, returns it to the ground and asks that the horse be jogged down your asphalt drive. In astonishment, you watch as the horse moves off most decidedly lame. What happened? What you have witnessed is a phenomenon not necessarily of the veterinarian’s creation, but something that can sometimes occur following a procedure called a forelimb flexion test. In a forelimb flexion test, various joints and soft tissue structures of the lower limb are stretched and/or compressed for a brief period of time by bending the limb. Afterward, the horse is immediately trotted off and observed for signs of lameness. Forelimb flexion tests were described in Swedish veterinary literature as early as 1923. They appear to have become an integral part of the evaluation of the lame horse. In addition, forelimb flexion tests appear to be routinely included in repurchase evaluations of the horse intended for sale. In performing the tests, a veterinarian will likely pick up the horse’s leg and bend it, with the bending force centering around the fetlock joint. He or she will hold the leg for a period of 30 seconds to 60 seconds, and then let go, asking the horse to trot off immediately. The test is not unlike what you might experience if someone asked you to sit in a crouch for sixty seconds and then run right off. Usually, you can run off just fine, but occasionally, you may experience some soreness or pain in the joint that results in some initial stiffness when you first try to run. You may be normal or the soreness could signal a problem (such as a bad knee). While forelimb flexion tests are quite commonly performed, veterinarians have not agreed on the optimum duration of the test, which can vary from 30 seconds to three minutes. Although there are devices available to measure the force applied during the test, these are not widely used in practice. A study involving 50 horses has been conducted to determine the effects that force of the test may have on the result. It suggests that reliance on forelimb flexion tests for a diagnosis of impending lameness or other problems may not be reasonable. The study also indicates that a positive response to the test does not correlate well with other indicators, such as X-rays of the lower limb. Here’s what I found in the study. I found that forelimb flexion tests couldn’t tell me anything about the future of a sound horse. I could make every single horse lame with a hard enough flexion test, with the exception of one particularly annoying Arabian gelding who was always trying to bite me. Horses that had “something” on their X-rays weren’t any more likely to be lame after a “normal” flexion test than horses that had “clean” X-rays. Horses that had positive “normal” flexion tests weren’t any more likely to be lame 60 days out, either (those horses that were lame mostly had things like hoof abscesses, which nobody could have predicted anyway). If you follow a groups of horses for 60 days, there’s a decent chance that a few of them might experience an episode of lameness. A positive response to forelimb flexion tests, meaning lameness was evident after the limb was released, is one reason horses may be deemed unsuitable to buy during the prepurchase exam. There seems to be a wide range of significance attributed to these tests that varies according to opinion and the experience of the examiner. There have been many purchase exams discontinued solely because a positive response to a flexion test in one or both forelimbs. Because of the variable response to the test depending on such things as the force applied, duration of the test, age of the horse and the day of examination demonstrated in studies, discontinuation of a repurchase examination based solely on a failed forelimb flexion test is probably unwarranted. Owners and trainers have become increasingly skeptical of the significance of forelimb flexion tests during these examinations. Horses can and do perform well for a variety of riding endeavors even when they do not perform well on a forelimb flexion test. If you’re a buyer, don’t be too eager to walk away from a horse that you otherwise like just because he takes a few lame steps after a flexion test. You have to consider a lot of other factors, such as whether you like the horse, or whether he does what you want him to do, or if he’s a color that you like. You just can’t consider the forelimb flexion test in a vaccum. It has to interpreted in light of clinical findings such as fluid in the joint, reduced limb or joint flexibility, pain to palpation, or clinical lameness in the limb that demonstrates the positive response. If you see abnormal X-rays findings (such as osteoarthritis) in a limb that has a positive response to a flexion test, that may add some significance, and particularly if there is concurrent clinical lameness. However, to keep things confusing, my study also found that many radiographic abnormalities occur in clinically sound horses. Remember, you have to ride the horse – you can’t ride the radiographs. If your horse does respond to a forelimb flexion test, don’t stop there. Further examination of the horse through the use of X-ray may be warranted. 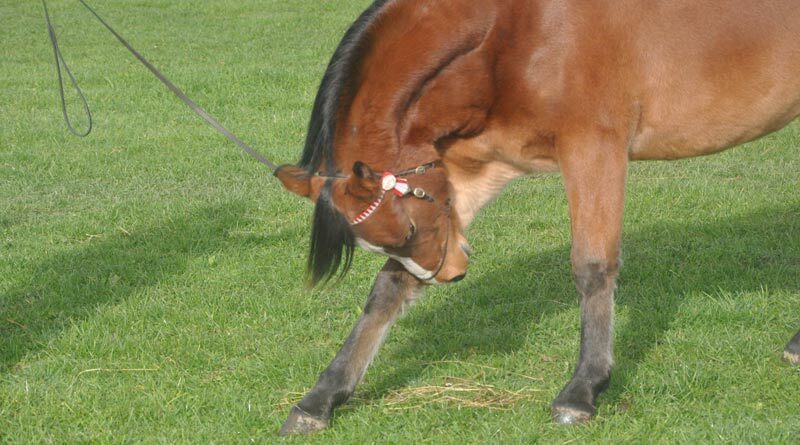 Look for other signs of a problem, such as lameness, loss of limb flexibility or a painful response to palpation and/or manipulation of the area that you suspect may be a problem. With a complete examination, you will likely receive the answer you need and could be looking for. Dr. David Ramey is a 1983 graduate of Colorado State University. After completing an internship in equine medicine and surgery at Iowa State University, he entered private practice in southern California. His practice is devoted to the care of pleasure and performance horses of many different breeds and occupations. He is the author of numerous books and articles on horse health.